Probably these miniature cups were not intended for a wedding tea set but more to serve wine and other offerings on the household altar. Each is beautifully gadrooned, with each alternate gadroon being finely chased with prunus (plum) blossoms. 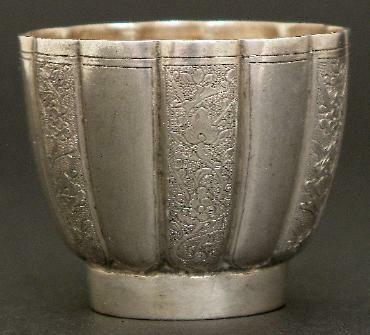 Each cup has a good weight in the hand and is of relatively thick guage silver sheet. There are no shop or silver marks. It is likely that the cups are of Straits rather than mainland Chinese manufacture. From a collector who acquired them some years ago in Singapore.